Aspiring Lexus owners may have a hard time refusing Brendan Harrington’s latest offer: Get a lightly used version of one of the hottest luxury SUVs in America for as little as $370 a month. The terms—offered by Mr. Harrington’s Longo Lexus dealership near Los Angeles—come as part of a lease deal on a three-year-old RX 350 with 35,700 miles on the odometer. Spanning 36 months and 45,000 miles of use, the lease requires little money up front and is potentially hundreds of dollars less than a comparatively equipped new model sold at similar terms. Inventories of used cars in good condition are soaring in the U.S., and finance companies and dealers are scrambling to offer leases as a way to make payments affordable for people who don’t qualify for cheap deals on new cars or those looking to save cash. 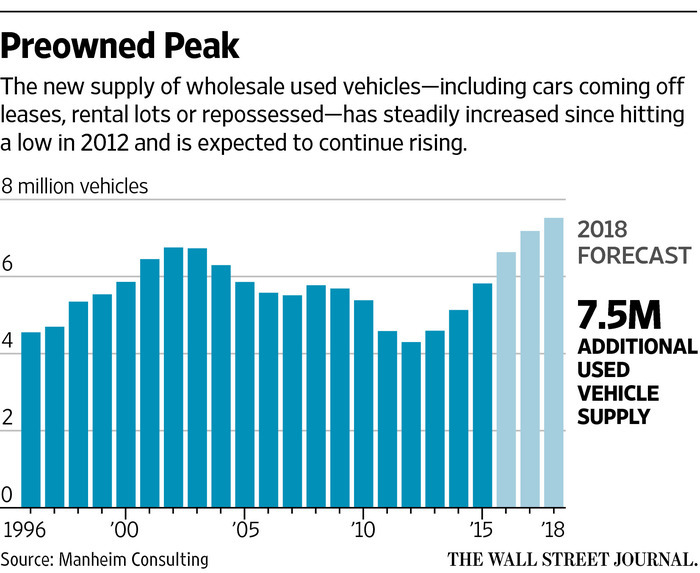 New-car sales gained steam in recent years, creating a glut of used vehicles. Those inventories are problematic for auto makers hoping to maintain a record sales pace on fresh sheet metal and remain profitable in the process. Sales of used cars rose 7% in the first quarter, according to the National Automobile Dealers Association, but wholesale pricing fell during each of those months verus 2015, Manheim Consulting data shows. Manheim estimates used-vehicle supply will hit records in during a three-year period starting in 2016. Lower used-car prices will eventually dent new-car pricing power, analysts said. As auto makers continue to subsidize car payments with discounts, reduced interest rates and cheap lease terms, car owners are turning in relatively new vehicles that could be attractive to those in the pre-owned market. But these products are out of reach for many buyers due to the size of monthly payments on a nonsubsidized vehicle loan. This is where leasing comes in, particularly on vehicles with low miles and high sticker prices. The finance company estimates the vehicle’s value at the end of the term and sets a rate based on that residual. The lease takes risk and repair bills off the table. Mr. Harrington wasn't leasing used Lexus products at the beginning of the year. By March, 10% of his pre-owned sales came from leases. Sales managers historically avoided used leases because they were difficult to calculate, but greater access to auction results and real-time sales data is changing dealers’ attitudes. Mr. Harrington, for instance, has developed his own software to aid the process. More lenders also are getting in the game. Ally Financial Inc., one of the nation’s largest lenders and a former subsidiary of General Motors Co., started offering used leases in March. The company’s auto-finance president, Tim Russi, estimates eventually one-third of the 20 million-plus used-car purchases that are financed annually could be leases. If this increases demand for used cars, it could bolster their market value. “I think this is good for the holistic system,” he said. One of Ally’s clients is Bermont Motors Inc., a used-vehicle dealer near Philadelphia. It has a 2014 Jeep Wrangler on its lot that would cost $544 monthly with a five-year loan, for example. Agreeing to a shorter-term lease would push the payment down to $364 monthly. Ale Resnik, co-founder of Beepi Inc., an online used-car retailer, said the Silicon Valley company will start leasing later this month as a result of its Ally partnership. His service, which started selling cars two years ago, is aimed at younger buyers typically looking to establish credit. “Data shows millennials are the ones driving car sales growth in new and used vehicles, and they need more options that enable their freedom,” Mr. Resnik said. Leasing accomplishes that. The typical used-car lessee has a 635 credit score, 80 points lower than a new-car buyer, according to Experian PLC, which produces credit reports. While only 3.8% of vehicle leases written in the fourth quarter of 2016 were on used vehicles, that number is up a half percentage point compared with the second quarter of 2015. More than 16% of vehicles purchased—new and used—in the final three months of 2015 were leased, compared with 11.5% in the same period in 2012. Used-vehicle supply was extremely thin four years ago following a sales drought during the financial crisis.